Unlike their colleagues in music theory and music education, teachers of music history have tended not to commit their pedagogical ideas to print. This collection of essays seeks to help redress the balance, providing advice and guidance to those who teach a college-level music history or music appreciation course, be they a graduate student setting out on their teaching career, or a seasoned professor having to teach outside his or her speciality. Divided into four sections, the book covers the basic music history survey usually taken by music majors; music appreciation and introductory courses aimed at non-majors; special topic courses such as women and music, music for film and American music; and more general issues such as writing, using anthologies, and approaches to teaching in various situations. In addition to these specific areas, broader themes emerge across the essays. These include how to integrate social history and cultural context into music history teaching; the shift away from the 'classical canon'; and how to organize a course taking into consideration time constraints and the need to appeal to students from a diverse range of backgrounds. 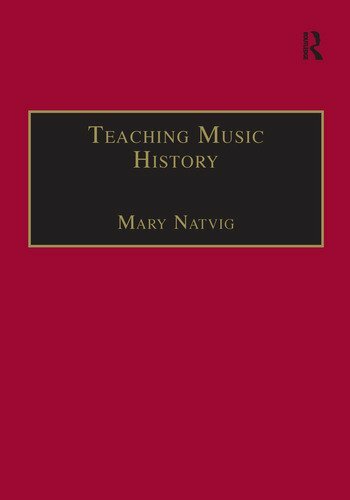 With contributions from both teachers approaching retirement and those at the start of their careers, this volume provides a spectrum of experience which will prove valuable to all teachers of music history. Contents: Introduction; Approaches to the Music History Survey: Providing context: teaching medieval and Renaissance music, Patrick Macey; Teaching baroque music to the bright and interested and ignorant, Kenneth Nott; What Chopin (and Mozart, and others) heard: Folk, popular, "functional" and non-western music in the Classic/Romantic survey course, Ralph P. Locke; Teaching music history (after the end of history): "History games" for the 20th-Century survey, Robert Fink; Teaching Non-Majors: the Introductory Course: Interdisciplinary approaches to the introduction to music course, Maria Archetto; The "why" of music: variations on a cosmic theme, Majorie Roth; First nights: awakening students' critical skills in a large lecture course, NoÃ«l Bisson; Topics Courses: Teaching "women in music", Mary Natvig; Teaching film music in the Liberal Arts curriculum, Michael Pisani; Don't fence me in: the pleasures of teaching American music, Susan C. Cook; General Issues: Teaching at a Liberal Arts college, Mary Hunter; Teaching in the centrifugal classroom, Pamela Starr; The myths of music history, Vincent Corrigan; Score and word: writing about music, Carol A. Hess; Peer learning in music history courses, J. Peter Burkholder; Creating anthologies for the Middle Ages and Renaissance, Russell E. Murray, Jr.; Bibliography; Index.